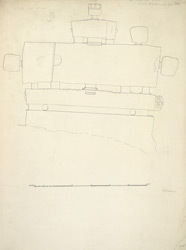 Plan of Cave XXVII, called the Milkmaid's Cave, a Hindu cave temple at Ellora from James Burgess' 'Original Drawings [of] Elura Cave Temples Brahmanical and Jaina, IIII.' The spectacular site of Ellora, in Maharashtra, is famous for its series of Buddhist, Hindu and Jain cave temples excavated into the rocky façade of a cliff of basalt. The works were carried out under the patronage of the Kalachuri, the Chalukya and the Rashtrakuta dynasties between the sixth and the ninth centuries. ?The plan has been supported by six plain octagonal pillars with bracket capitals, but all of them have fallen awayexcept one at the left end and a fragment of one at the right end. The verandah is about 69 feet long by 8 feet 4 inches wide, with several sculptures on the back wall and in the ends. In the walls of the hall three cells are rudely excavated. The carvings are mostly Vaishnava in character...."